Open the pages of this book and you’ll see how pluck, perseverance, and paint were the virtues that build Apex after a devastating war and then rebuilt the community again and again after fires, epidemics, and the collapse of the turpentine and tobacco markets. 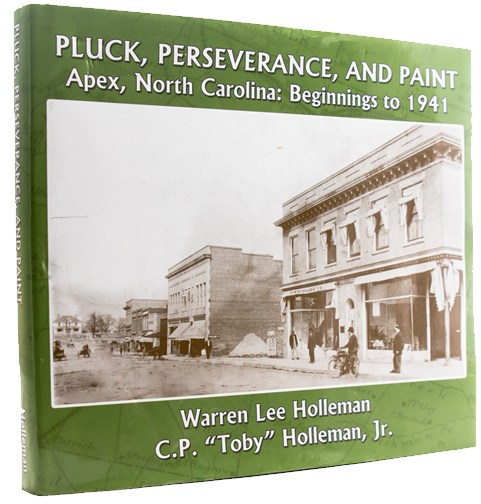 Pluck, Perseverance and Paint: Apex, North Carolina: Beginnings to 1940, by Warren Lee Holleman and C.P. “Toby” Holleman, Jr. Published by Halcyon Press, Ltd., Houston, Texas. Featuring photography, illustrations, and maps by Marty Allen, Jerry Miller, and Staley C. Smith. First published in 1973, at the time of Apex’s Centennial Celebration, Pluck, Perseverance and Paint has been revised and expanded to five times its original length. The new book is 340 pages in length and features 160 photographs, maps, and illustrations. The book’s title is drawn from Apex’s first motto, describing the virtues of her early citizens and the tools required to turn a swampy “Log Pond” into a bustling community. Pluck, Perseverance and Paint covers not only early Apex, but all of western Wake County prior to World War II. The new edition presents both written and oral histories of the Apex area on such topics as slavery, the Civil War, Reconstruction, the Roaring Twenties, and the Great Depression. While learning about the history of Apex, readers will also learn about the history of central North Carolina, the South, and the entire United States during this formative period of our nation’s history. And because the book is written with both intelligence and wit, the reader will be entertained as well.